Learn more about a variety of social justice oriented events happening at the start of the school year! HBO presents the 2nd Asian Pacific American Visionaries Short Film Competition, which provides emerging directors of Asian Americans the opportunity to share their stories and showcase their work. The 10th RUSDOCFILMFEST-3W, the annual Russian Independent Documentary Film Festival, will take place in Manhattan on October 20-22, 2017. The London International Documentary Festival is calling for films on all subject matter. First time and established filmmakers all welcome! 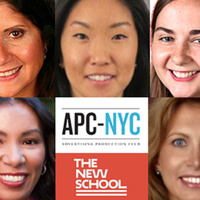 Join us for an incredible discussion and reception with a few of the biggest and brightest names in the media industry, hosted by the APC and the Media Management Graduate Program at The New School. NYC Television Week is looking for student volunteers to assist onsite!